UK outlets for discount designer shopping and all kinds of brand name products have sprung up all over the place. There are some excellent buys out there and, if you don't mind buying slight seconds or things that are six months to a year behind the leading edge fashions, you can do very well. They sell a variety of goods and brands, usually a mix of men's, women's and children's fashions, shoes, accessories and jewelry, luggage and handbags, sporting goods, toys, electrical goods, housewares and linens and, occasionally sweets, dried fruits and nuts. 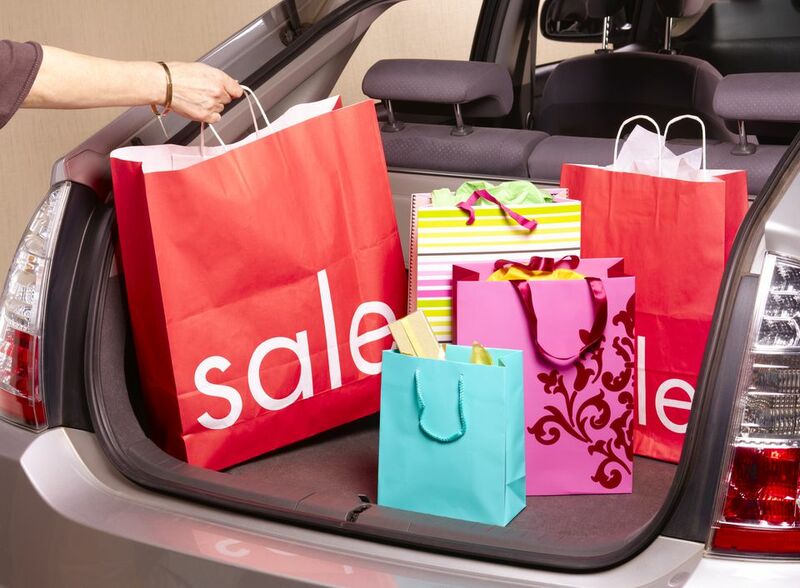 Before you go on a discount outlet shopping spree though, it's a good idea to research prices and brands to make sure you really are finding bargains. Scroll down to the bottom of this article for some consumer advice. The Galleria Outlet Centre in Hatfield, Hertfordshire, has more than 80 shops and food outlets, most of them familiar high street brands. The center's facilities include an Amazon Locker service where you can pick up or return goods from the online retailer. There's a jungle themed adventure playground for children - with a cafe where adults can rest from their exhausting shopping - and a multi-screen movie theater. Bicester Village near Oxford is world famous, attracting visitors from all over Europe and the Far East to its huge collection of designer outlets. Bicester Village even has its own rail station making it very easy to reach from London. Gunwharf Quays in the middle of buzzy Portsmouth Harbour is beside Portsmouth's outstanding Spinnaker Tower. Even if you're not in the mood to shop, the area, also near Portsmouth Historic Dockyard and the Mary Rose Museum, is a great place to hang out on a sunny day. Swindon Designer Outlet in Wiltshire has lots of famous brands and a specialty in childrens' wear. To keep the kids happy, they have kiddie rides, little - and safe - "self drive" cars for kids and a towering climbing wall. Clarks Village in Somerset is not far from the shoe manufacturer's headquarters in Street, Somerset - (yes that's really the name of a place).The center has outlets for a number of fashion manufacturers but, as you might imagine, you can get some great factory outlet bargains on Clark's shoes. Wilton Shopping Village in Salisbury, Wiltshire has a pretty compelling selling point. Besides the national brand retailers available, the center has a courtyard selling area surrounded by the shops of independent designer/makers, craftspeople and artisans. It is also the home of famous British Wilton carpet manufacturing so, while you're there you can get some bargain floor covering, discontinued colors and usable-sized carpet roll ends. Ashford Designer Outlet in Kent, is the place to stop if you are heading to or from France on Eurostar from Ashford International Station, nearby. The center, designed by British architect Lord Richard Rogers, is a visually stunning place to engage in retail therapy. Freeport Braintree in Essex has loads of popular brands - at least 85 shops - and most promise 60% off retail prices. Clacton Shopping Village Clacton on Sea in Essex, recently changed its name from Clacton Common Shopping Village and added a Marks & Spencer outlet store to its small selection of shops. Located in an old fashioned, blue-collar seaside resort, in 2019 this center was promising a new start but still had only 20 active shops, most at the more budget end of the high street spectrum. Useful if you happen to be in the area and need to do some shopping for the kids or Denby housewares. Otherwise, not really worth a trip. East Midlands Designer Outlet in South Normanton, Derbyshire is about halfway between Sheffield and Nottingham. This outlet is part of a group that tends to focus on familiar brands rather than real designer bargains. But, if you are looking for a particular brand of sports shoes, jeans or t-shirts at less than high street prices, you will probably find them here. Affinity Staffordshire near Stoke on the Cheshire/Staffordshire border. changed its name from Freeport Talke. There are 44 stores, a mix of popular brands and shops that only seem to appear in discount malls (see Let the Buyer Beware, below). The mall is anchored by a Market & Spencer and has branches of Sports Direct and Nike on its list. Springfields Outlet Shopping near Springfields Festival Gardens in Spaulding, Lincolnshire has about 50 shops offering goods at up to 70% less than recommended retail prices (RRP). Gloucester Quays Designer Outlet has lots of familiar brands and a rather scenic setting near the Gloucester Historic Docks on the Gloucester Ship Canal. There's also a multi-screen movie theater so if one of you isn't into shopping, you can take in a flick while your partner enjoys retail therapy. The mall's British made brands include the London cult handbag maker Radley. York Designer Outlet Village close to the city of York, is operated by McArthur Glen, a company that runs quite a few of these outlets around the country. Expect to see a lot of the same brands you'll find all over the place. But there are some nice designer shops too - Michael Kors, Margaret Howell, Paul Smith, Kate Spade among them in 2019. Lakeside Village Outlet Centre in Doncaster is not far from the Doncaster Racecourse and The South Yorkshire Aircraft Museum.. Special discounts are available if you go with a group of 20 or more. The Mill Outlet and Garden Centre in Yorkshire claims to be the UK's biggest retail mill. There are four floors of discount shopping - clothing, furniture (lots more than you might expect), house and giftware - and 30% discounts are promised. Junction 32 in Castleford, West Yorkshire. While you're shopping, the kids can try the snowslope or the climbing wall at Xscape, or have a round of crazy golf. Royal Quays Outlet Centre in North Shields, near Newcastle is big and modern with a huge Next clearance outlet. But they also have a Poundland (apparently the first Poundland outlet in the UK). Since this retailer (similar to dollar stores in the USA) is already at shopping's bottom ends, I wonder how they can discount - selling £1 goods for 99p perhaps? Cheshire Oaks Designer Outlet in Ellesmere Port, South Wirral is another McArthur Glen center. This one claims to be the UK's largest designer mall with 145 stores. The chi-chi line-up reflects the well-heeled locals in Cheshire - a favorite home of Manchester footballers. Designers in this center include Gucci, Armani, Michael Kors, Burberry and Mulberry. It's also a place to nab a Kate Spade bag at 50% off and some silly Haribo sweeties. K Village In Kendal in the Lake District is more of a wet weather diversion if you are hiking or camping in the Lakes, than a genuine designer mall. Check out the K Shoe heritage center. This once Victorian brand was taken over by Clarks, their nearest competitor, after the millennium. The outlet is located in the companies former factories. Lowry Outlet Mall Salford Quays, Manchester, has most of the usual suspects among its 60 brands. They promise 70% discounts from recommended retail prices (but who actually pays recommended retail prices these days). The big draw here is that the outlet is part of Salford's hyper modern Media City - well placed if you are visiting the BBC. Livingston Designer Outlet in West Lothian, between Edinburgh and Glasgow, has 70 designer brands, but don't expect a particularly Scottish twist to your shopping here. Sterling Mills Outlet Shopping Village in Tillicoultry, Clackmannanshire, Central Scotland has the distinction of being located in the smallest county in Britain. This is a small shopping center, full of outlet brands - the ones that show up more at discount centers than anywhere else. But the setting in the Scottish hills is very pretty. If you are looking for local goods with a Scottish twist, aim for the last weekend of each month when the central area of the village is taken over by " Market Street", an open air market with farm produce and craft products. Gretna Gateway Outlet Village on the Glasgow Road, in Gretna, is near the famous Old Blacksmith Shop, where elopers used to marry. In among the typical assortment of outlet shops, there are a few genuine Scottish outlets, like Gretna Green Stores, where you can find tweeds, cashmeres and woolens from around Scotland and the Scottish isles. Bridgend Designer Outlet in South Wales has moderately priced high street shops plus a few, like Jaeger, at the higher end. Festival Park Branded Outlet Shopping Village in Ebbw Vale, Gwent is part of a leisure resort. In between opportunities to spend money on things, the family can try the UK's longest supertubing run, an owl sanctuary, an adventure castle and a scary looking treetop climbing attraction called HangLoose. The Boulevard Outlet Shopping, located in Banbridge, about 25 miles southwest of Belfast, this large mall has a pretty good selection of high street and international brands. Because it's about half way between Belfast and the border with the Irish Republic, some stores accept Euros from Irish shoppers. Best to check before you go. There are 56 stores and occasional special events, such as Irish whiskey tastings. The Junction, on the Ballymena Road in Antrim, is about 20 miles from Belfast. It's a combination outlet mall and leisure center. In addition to high street brands, there are children's activities and a 10-screen cinema. Linen Green This designer village has the unique feature of being located in the historic Moygashel Linen mills. In 2019, 30 niche designer outlets filled separate buildings named to reflect their origins - The Workshop, Cloth Loft, Weaving Sheds, Framehouse, Warehouse, Dyehouse & Bleaching Sheds. The mills, started in the 1700s were, in their day, amongthe most advanced water powered linen mills in the world. The owners are planning a museum at the site, highlighting the areas industrial past. Meanwhile, today, you can shop in a range of independent designer shops, many unavailable in outlets anywhere else. Don't get carried away by the sale atmosphere. If you've ever opened your closet, looked at your bargain booty and wondered, What was I thinking!, you know who you are. Remember that promises of 50 to 70% off are usually off recommended retail prices [rrp] and in a lot of cases the rrp is wishful thinking on the part of the manufacturer rather than what you might pay in normal stores. Examine items very carefully. Seconds should be so marked, but they aren't always. Make sure that the condition of what you buy is acceptable to you because most UK discount and designer outlets have a no return policy. Several of the UK discount outlets are part of multiple operations (sometimes global operations) with the same shops cropping up again and again. Just as ordinary shopping malls have their cast of the usual suspects of global brands, the UK discount outlets have an assortment of regulars all over the country. Some are outlet branches of popular high street brands and some malls, like Bicester Village, feature an impressive range of genuine luxury brands. But be aware that a range of brands has developed that only seem to crop up in the world of UK discount outlets. A good way of checking is to look up the "store locator" on a brand's website to see if most of their stores are in outlet malls. There's nothing really wrong with that. It's just something you should know when you are considering the "bargains" on offer. The UK also has a good selection of factory shops specializing in the products of only one manufacturer or manufacturing group.Often these are located in or next to the factory itself.Check here to find genuine British made fashion from dedicated, stand alone factory shops .